Since this show, about five and a half years ago, The Gypsy Nomads have changed their name to “Frenchy and The Punk,” The Buttonflies have broken up and former members are now in The Laser Beams, Qiet and other bands, and Josh and Murfmeef need to start doing more stuff again. Also, “Toxic Soup” won a bunch of awards. 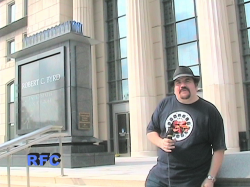 Host segments were shot in front of the Robert C. Byrd Federal Courthouse, which is still there.